How does living near urban green space affect your life satisfaction? 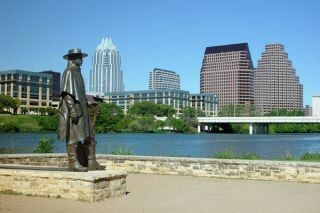 But, the city of Austin, itself is quite green. There are lots of small parks, greenbelts, and hills with woods. In the center of town, Ladybird Lake is ringed with a trail that is always full of walkers, runners, and bikers. If you live in a place with lots of parks like this, does it affect your life satisfaction? This question was explored in a paper in the June, 2013 issue of Psychological Science (link is external) by Mathew White, Ian Alcock, Benedict Wheeler, and Michael Depledge. They did a longitudinal analysis of data in Great Britain collected over a period of 18 years. The study involved over 10,000 people from urban areas and asked general health questions (including questions about their mental health) and questions about well-being. The data also permitted the researchers to determine how much green space was located in their neighborhood. Green space included parks and gardens. The survey also had questions about other factors that affect well-being like education, marital status, age, and employment. The researchers entered these variables into a statistical analysis to determine the factors that predicted mental distress and overall ratings of well-being. As you might expect, being married was associated with lower levels of mental distress and higher levels of well-being. Likewise, being employed (rather than unemployed) was associated with lower levels of mental distress and higher levels of well-being. These effects are rather large overall. After taking all of these factors into account, living near parks did affect people’s mental health. People experienced lower levels of mental distress and higher-levels of well-being when they lived near green space in their urban area. On the one hand, these effects are reliable, but small. The influence of living near parks was about one third the size of the influence of being married and about one tenth the size of the influence of being employed. As the authors point out, though, marriage and employment affect only individual families, while parks can influence whole neighborhoods, so the collective influence of parks on well-being can be enormous. Demographic trends suggest that people are moving back to cities. Living in urban areas has many benefits such as low commuting costs and access to many interesting cultural activities. Living near parks, though, has a number of benefits. Parks allow people a chance to get away (even briefly) from the stress and noise of the city. Parks also provide places for exercise and movement. This research also suggests that governments should support the construction and maintenance of green areas in their cities. Around the world, this is a time of austerity. Governments are cutting back on the services they provide. But, mental well-being translates into physical well-being. People who feel good about life take better care of themselves than those who do not. This work suggests that a relatively small investment in urban green spaces can save governments a lot of money down the line in health-care costs. Finally, this work suggests that if you are moving to a city, you should look for a neighborhood that is near to parks and gardens. Being close to these green spaces will help you to engage in activities that will keep you healthier and happier.